The title says it all! Nestle is known for its quality and purity, and has a unique, special taste for all its products. What is special about Nestle a+ Dahi that makes its consumers go for it? 3. It is transported to shops everyday under stringent quality control measures that assures you of its freshness. 4. It is true that it is deliciously rich, creamy and thick. 5. It has no added preservatives. The above features and the price factor make consumers convincing to buy one! The packaging, undoubtedly, is pretty notable. And as the tag reads, it does have an incredible flavor and is smooth, creamy and thick. The taste however, is not very much different from the regular Nestle dahi. As far as the nutrition facts are concerned, calorie and fat numbers makes it an ideal accompaniment with our meal. Being rich and creamy in texture, it can be used in the preparation of raitas, toppings for fruits, desserts and as an energy food between your meals. 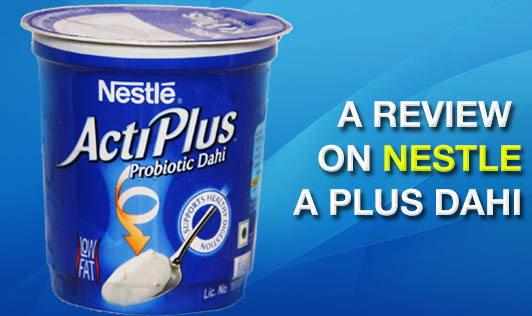 Above all, Nestle a+ Dahi can be used by individuals who are calorie conscious and those with digestive disorders. If you are one of those suffering from diarrhea, this can be an option to your regular set curds. Although the recommended daily calcium requirement for an individual is met to some extent, the remaining should be obtained on a daily basis from other food sources like milk, paneer, greens, soy, fish, flavored yogurts, tofu and few other vegetables. "Good" bacteria naturally reside in the body and are commonly referred to as probiotics. In certain foods like yogurt, many manufacturers add live cultures to contribute to overall health. There is mixed evidence regarding the effectiveness of probiotics for preventing and treating diarrhea, but it might be helpful in a number of circumstances such as traveler's diarrhea or diarrhea associated with antibiotic use. Since yogurt is a part of a healthy diet for most, there is no harm in consuming a cup per day. However, if you are living with a condition that compromises your immune system, talk with your physician first before you purchase yogurt with added culture. If you are a working professional, it is a good choice for filler between your meals. You could either purchase them at a supermarket or set curds prepared at home is always a preferred option for you!